Quick Mango Kulfi - Do You Know The Muffin Man? 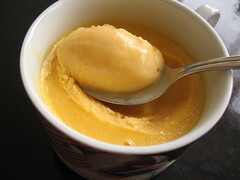 Notes: I bought a can of Kesar mango pulp to make this ice cream. It's quick because it doesn't involve boiling milk, instead, using a mix of evaporated milk and whipping cream. There's way too much sugar, this is tooth-achingly sweet. However, the texture is soft and the mango stands out. This book came from a used bookstore in Guelph a few months ago. Lots of history, pictures of old-fashioned ice cream implements, old advertisements, unusual recipes, looks like a good resource.